I'm really happy with how this is coming along! 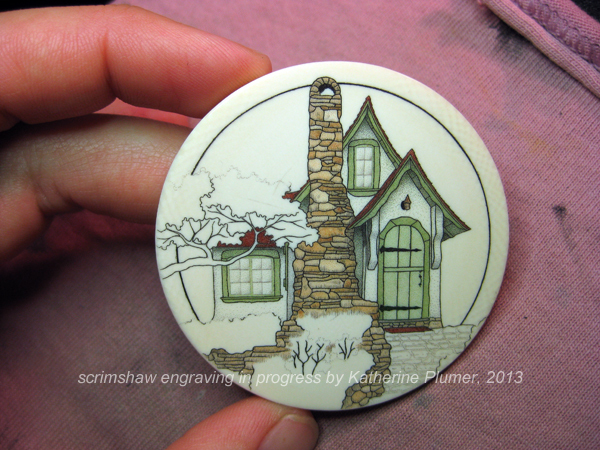 I have to finish the sidewalk/steps, put in the tree and shrubbery, and then do a little something with the background. In real life this cottage is surrounded by trees. I am not planning to put all those trees in the background. I LIKE this clean composition, I really don't want to clutter it up with a bunch of stuff behind it. Unless I get to that point and think it needs it... but I don't think that'll happen. That's not the plan. But I'll do a little something to get the border to "pop." Just you wait and see. So far your scrimshaw "rocks the house." hee-hee. BMc. will u follow me back? heee..
Are you going to show the finished project.